Thank you Alfredo! Here is the archaeological site of Alba Fucens, occupied by the Romans in 304. This view shows the Street of Pillars, where pillars deliniate the workshops which once lined the avenue. 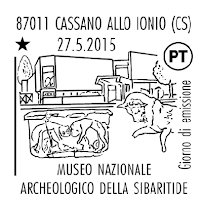 This stamp is from the 'Italian Artistic and Cultural Heritage' 5v of November 30 2013. Thank you Alfredo! 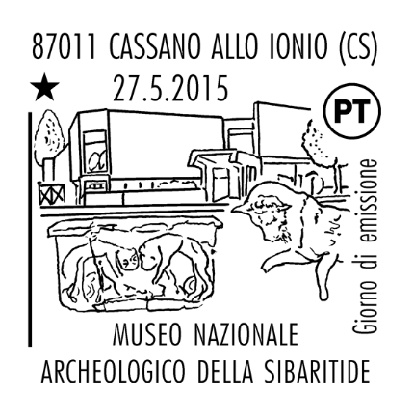 The series continues with this 2015 stamp of the National Archaeological Museum of Sibaritide. These are from a set of 7. Cancellation for the first day of issue.